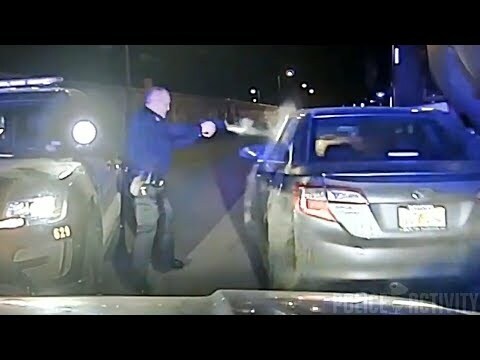 The Pueblo Police Department on Wednesday released footage of a fatal officer-involved shooting of a man who attempted to run officers down with his car. The video shows a Feb. 5 shooting that killed Andrew Byrd, 35, who backed his vehicle into a patrol car before driving at other officers in the area of Small and Acero avenues just after midnight, police said. Officer Neal Robinson fired one round into the driver's side of a Toyota Camry, killing Byrd, police said. Hours earlier, a woman reported that her 2005 Lexus sedan was stolen by Byrd, a known gang member with active warrants for his arrest, police said. He then returned to the neighborhood in a Camry. A shootout followed that resulted in Byrd's death, police said. The video shows the Camry was stuck underneath a semi-truck before backing out and hitting a patrol car. Robinson and fellow officer Bernadette Lambert were placed on paid administrative leave. In August, the Pueblo County District Attorney's Office ruled the shooting justified. According to police, Robinson said he felt his life was in danger when he saw Byrd reaching for a possible weapon and driving toward him. In a police report, Bernadette fired a shot at "Mr. Byrd based partially on her belief that he had shot Officer Robinson."